Our hydroponic gardening, 21 plant, Dual Chamber (model Q-9)and the Single Chamber, 17 plant (model Q-17) are the most complete Plug 'n Grow 'indoor greenhouse' that is quick to set up, easy to use and requires little maintenance or indoor growing expertise. 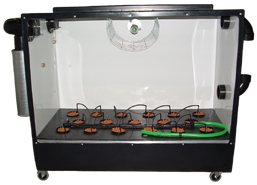 All QuickGrowHydroponics indoor gardening chambers create continuous monthly seed to bloom production. Set-up your chamber, add water and plug it in to any regular wall outlet, close the door and away it grows. The only additional hydroponic supplies you may need would be fertilizers, if required and a little TLC. Growing without soil and without mess, also known as 'Hydroponic Gardening', or growing Hydroponically, has long been recognized as the best home grown method for plant propagation, vegetative growth and flowering plants for the highest of yields in the most compact of areas. We have been incorporating that theory and technology into our chambers since 2001 and have come up with a complete hydroponic gardening greenhouse system that only requires water and plants or seeds on your part. We supply you with everything else you would require, right down to a funnel for topping up the water levels. Our dual and single hydroponic growing chambers incorporate our durable design and unique Plug 'n Grow technology to maximize every customer's full growing potential, whether used for 'low tech' or 'high tech' plant growth and developement. Continual growth through simultaneous propagation, vegetation and blooming can be accomplished for the new hobbyist or experienced indoor gardener, and gardening enthusiasts. 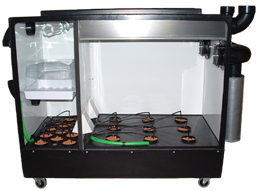 QuickGrowHydroponics uses the most advanced hydroponic equipment and quality components in manufacturing our hydroponics gardening growth chambers for hidroponic, aeroponics, ventilation, filtering, watering, ergonomics and timing. "Our customers insure their growing success when investing in any of QuickGrow Hydroponics hydroponic gardening systems. Many satisfied gardeners can easily produce high quality flowers, vegetables, fruits and herbs for home cooking or restaurants. Hobbyist, Naturopath's, Homeopathic & Chinese practitioners have reaped the natural benefits of producing healing herbs for therapeutic herbal remedies, in a quality controlled environment which is discreet and secure growing." Click on image for more features.